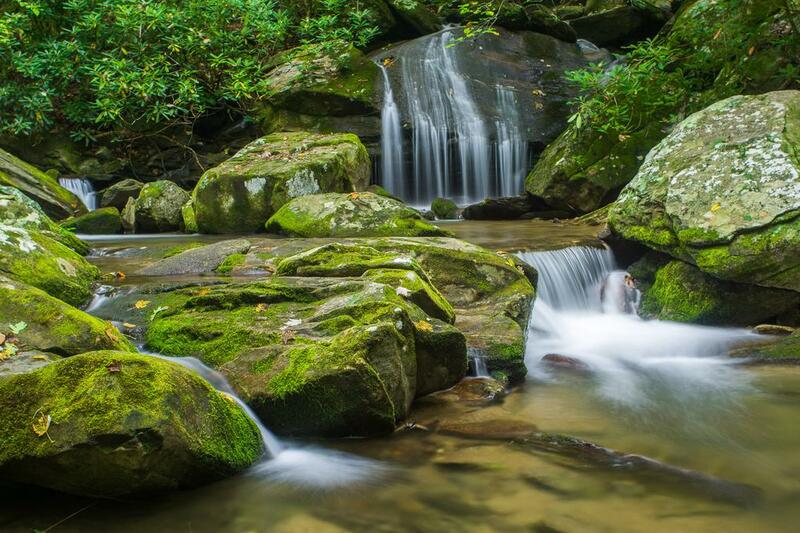 Catawba Falls, one of Western North Carolina's exceptional Blue Ridge waterfalls over 100 ft high, is now fully accessible to the public and a highly recommended destination. 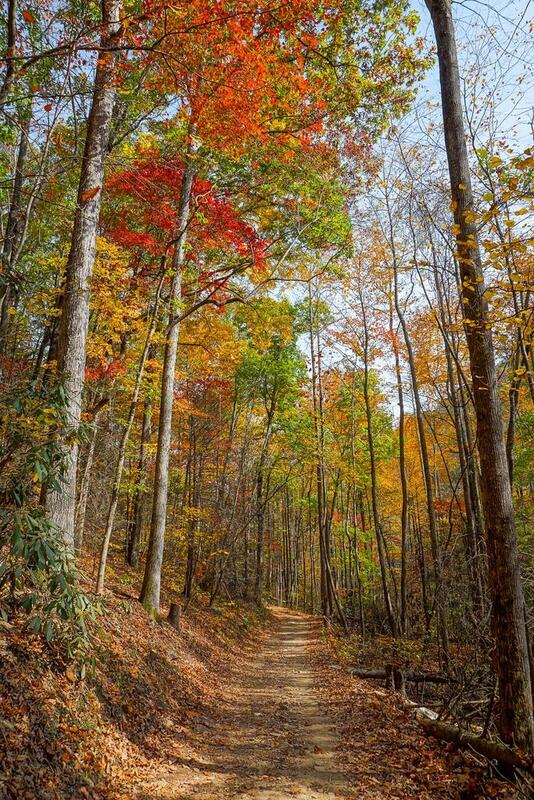 It's in the southern tip of the Pisgah National Forest's Grandfather Ranger District, just south of the Old Fort grade on I-40. A new parking area, trail, footbridges, and signage builds upon years of effort to provide public access to this formerly off-limits special historic area - access which literally required an act of Congress to accomplish! Lower Catawba Falls in high water with the pool - perfect for wading - at its base. Red and orange leaves arch over the Catawba Falls trail in early November. The waterfall itself is divided into two or three main sections (depending on who you ask). 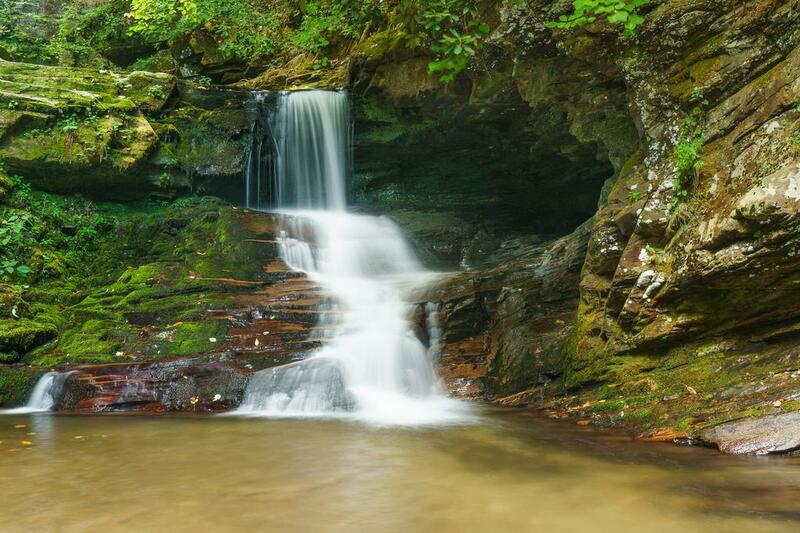 It's along a stretch of the Catawba River which flows off the steep Blue Ridge escarpment, where the higher mountain lands drop off to the Piedmont areas below. The river drops around 600 feet in about a half mile. No single drop comes anywhere close to that height, though. 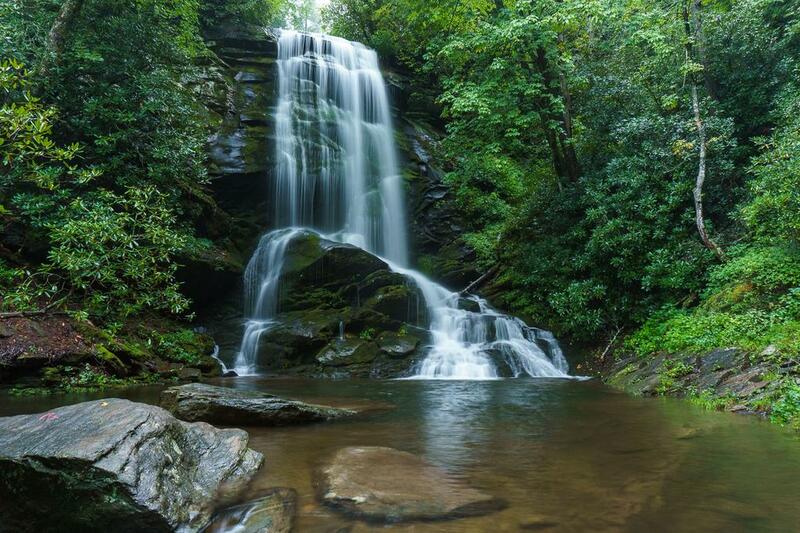 The main upper drop - often referred to as Upper Catawba Falls - is about 50 feet high and is a beautiful free-fall, ending in a split cascade into a deep, clear pool. 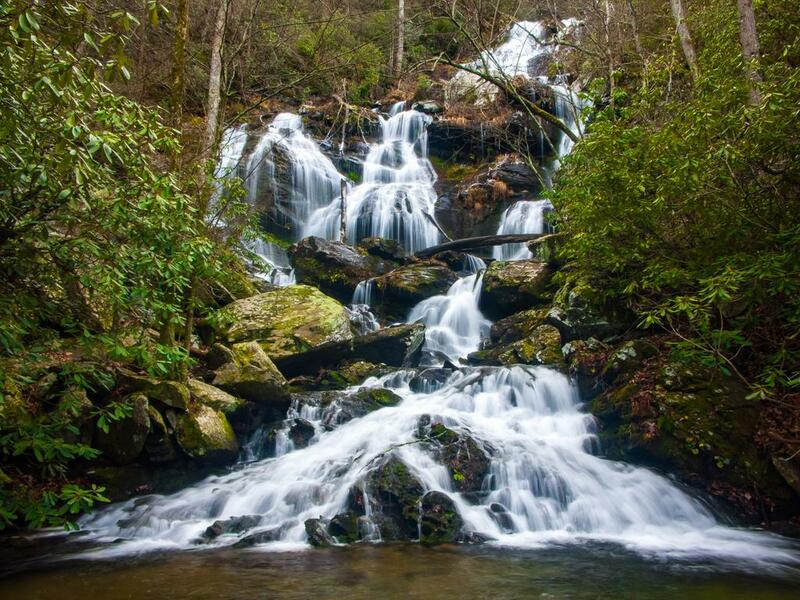 The middle (or lower) section, which is called just Catawba Falls (or occasionally Middle Catawba Falls) is over 100 feet high across multiple sections with free-falls and cascades. The flow splits into many distinct channels and goes all over the place across the rock face. Lush vegetation and a spray-cliff community of plants grow on the falls. It is partly obscured from view at the base by foliage during the summer months. 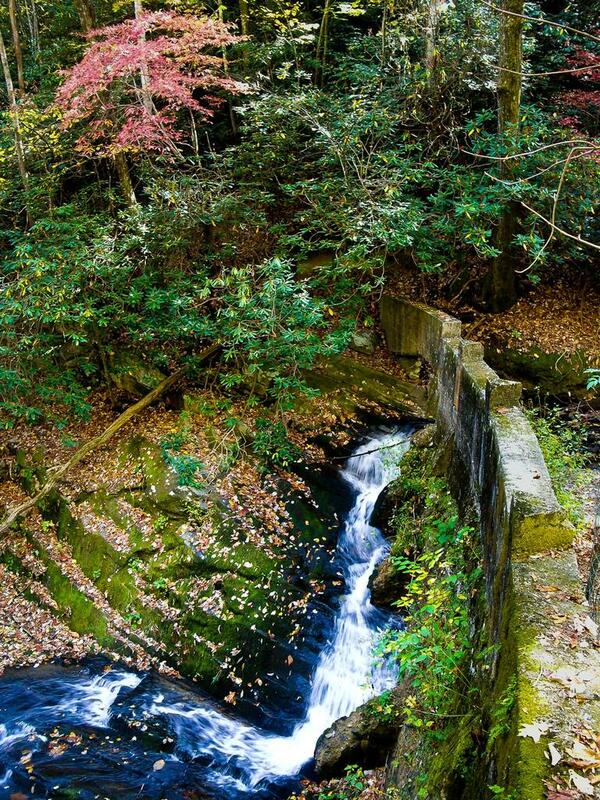 This cascade is located on the Catawba River below the location of the old hydroelectric dam. A neat cave is in the rock to the right of the falls. The small cascade below the old dam may constitute it own third "lower" part of Catawba falls. Much of this cascade is man-made and will be eliminated when the dam is removed, making it even smaller. But prettiest part of this cascade is natural and contains a free-fall section beside a cave. Personally, I think this cascade is large enough, far enough downstream, and distinct enough that it should have its own name. I'm not aware of any yet. The Catawba is more of a rushing creek than a river at this stage since it's the headwaters, and thus shares an attribute with most higher mountain falls: it looks best after wet weather. Still, there is enough acreage to gather water on the plateau above that it's worth visiting any time, even in periods of lower water. It never dries up completely, and takes on a different character as the water level varies. Right now, just one trail is located within this trailhead area, and it leads to the falls. An easy trail, it has been overhauled in the last few years and it is in better condition than years past, though it can still be wet and muddy after rains. Starting at the new parking area to the right of the restrooms, the trail leads upriver on eroded old road beds, crossing the (at this point) tranquil river on a huge new footbridge installed in July 2016 beside the old power generator building. 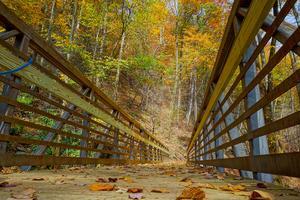 The main bridge over the Catawba River on the Catawba Falls trail, looking back toward the parking area, in fall color. The foundation of the old power generation building can be seen on the other side of the river. Beyond the bridge, the trail climbs moderately past some level areas beside the river. You'll hear the river picking up steam as you climb. You'll then pass some old building foundations and an old dam, and then the trail makes an easy rock-hop crossing of Clover Patch Branch. Cascade on Clover Patch Branch, which the trail crosses just before reaching the lower falls. 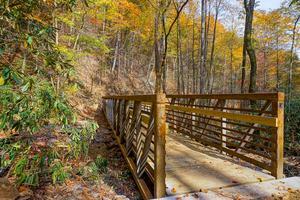 There is one more creek crossing at Chestnut Branch before you reach the falls. Thankfully, a fancy new bridge was installed here as well in October 2016, so it's now an easy walk across! Past the second bridge, the trail climbs again, and there are a few rocks to scramble over just before you reach the base of the falls at a rocky area with a small pebble "beach" below the pool. There is room for several folks to hang out and enjoy the view, which is good since you'll likely have company! Though the "trail" appears to continue up the right side of the lower falls. However, that way is closed; it is extremely steep, slippery, and dangerous, and it's located right next to the lower falls. It's steep almost to the point of technical rock climbing. The good news is, no reports of injuries have been made on the trail to the lower falls, and the Forest Service is planning a re-route of the trail to the upper falls, which should make them vastly more accessible. We set out next morning, following the fountain pipe, for Catawba Falls, which we reached this time without difficulty. On every side the forest was thick with the white and pink ivy, which was now in full blossom, mingled with the white laurel and the superb azalea - white, scarlet and brilliant orange. In going to the falls we followed, to the last mile of the way, the course of a stream, entirely without a path, down a very wild and steep yet extremely beautiful gorge. We had almost despaired of ever finding the falls, when suddenly we found ourselves at their foot. They are in two divisions. The lower is a succession of cascades, the whole aggregating nearly two hundred feet. Very beautiful they are, but the upper falls, with their single plunge, are still more so. The climb to the latter was like trying to walk up a wall. For two hundred yards or more, we had to hold on to trees and bushes every step lest we fall and know no more. The dam you'll see on the way up to the falls was built in the 1920's to provide hydroelectric power for Old Fort. Further downstream was a powerhouse, with the water being sent there from the dam via a pipe. To the right of the dam is the remains of another powerhouse, supplied by water from Chestnut Branch, which you cross just before the falls. Duke Energy company eventually acquired this small generating station and shut it down. By the late 1980s, the US Forest Service owned the land around the falls. It was being accessed by the public over private tracts, but the owners closed it off with a gate. 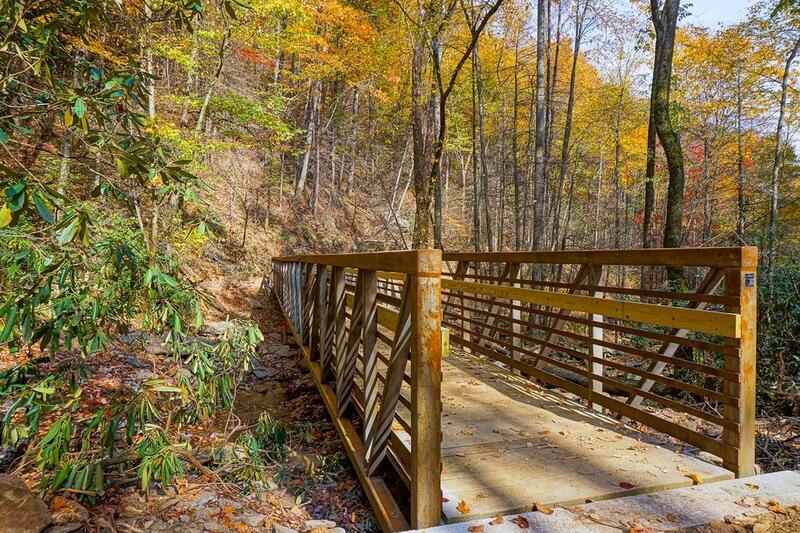 Soon, McDowell County abandoned their right-of-way over a stretch of road through private lands, essentially sealing off official public access (although some folks still came to the falls by trespassing, or off of an illegal access from I-40). Though the Forest Service put acquisition of the land needed to provide public access to the land it already owned at the top of its priority list, nothing changed for many years. 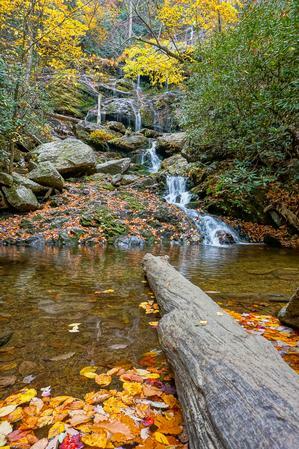 Lower Catawba Falls surrounded by fall leaves, which tend to collect in the crystal-clear pool below the falls. By the mid-2000's, some of the land near the easiest access point to the falls came up for sale. This re-kindled the idea of obtaining public access to the falls, but it also introduced the threat of land development, which would foreclose any possibility of public access forever. Luckily, a local land conservancy was able to quickly step in and purchase a key tract adjoining Forest Service property in two transactions during 2005 and 2007. Limited public access to the falls became available, but without a good parking area. And hikers had to cross one last piece of private property (which was authorized by a County agreement with the landowner) on their way to the falls after parking at the end of the road. Then, in 2009, funds for the purchase of this last parcel from the Foothills Conservancy were finally authorized by the Forest Service - and Congress authorized the Forest Service to expand the boundaries of Pisgah National Forest to purchase it. Then, in 2012, a huge new parking lot was completed - the (almost) final step needed to ensure permanent public access to the falls. Alas, the brand-new parking lot had to be closed for nearly a year after the rickety old bridge leading to it was damaged by a flood. But the bridge's replacement was completed as of early 2015, and the area is now fully open and accessible, complete with restroom facilities and signage. 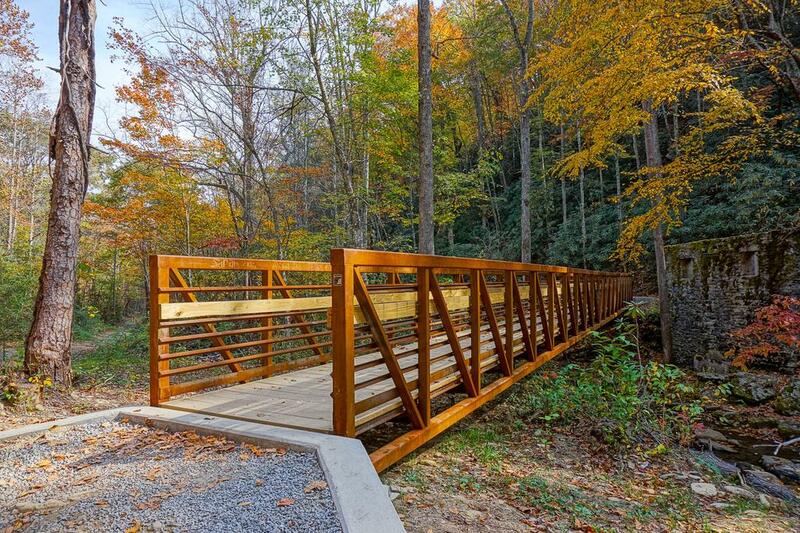 In July 2016, a new footbridge was built over the Catawba River near the start of the trail. That crossing, which used to be a sketchy rock-hop, was a barrier to many folks who might want to visit the falls without getting wet feet. In fact, the crossing was impassible during high water. But not anymore! The sturdy new bridge is huge, high above the river, and flood-proof. In October 2016, a second footbridge was installed over Chestnut Branch, and the trail was re-graded and fortified with retaining walls in places, making it a cake walk for the most part. Now nearly all hikers should be able to enjoy the lower falls! 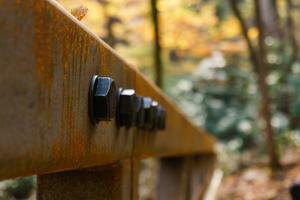 More improvements are planned for the recreation area in the future, including trail improvements to the upper falls. Though the upper falls are stunning, we don't recommend trying to access them due to the steep and dangerous climb required to get there. Upper Catawba Falls after a good summer rain. The area around Catawba Falls is designated as a Day Use Area, so no backcountry camping is allowed. However, there are private campgrounds in the vicinity. This campground is located just down the road from the new parking area. Walk from your campsite to the falls! The campground offers a number of tent and RV sites (with hookups) near the river, on-site conveniences such as a camp store, and camping cabins. Lodging is available in the nearby towns of Old Fort, Black Mountain, Marion, NC - all within about 1/2 hour drive of the falls. From Asheville, take I-240 E to I-40 E. Go just under 20 miles on I-40 to exit 73, the second Old Fort exit. Before the ramp ends, turn right onto Catawba River Road. Go 3 miles to the end of the road. The new, larger parking area is on the left side of the road just across the bridge.